A global 2-way symmetric wireless IIoT network supporting long range and very low power. RIIoT™ (Radiocrafts Industrial Internet of Things) is an RF system designed to meet the sensor and actuator connectivity requirements for the Industrial IoT. The RF protocol is the IEEE802.15.4 g/e standard that supports both 868 MHz and 915 MHz for global applications. RIIoT™ includes an Intelligent C-programmable I/O (i:zi), which makes it possible to directly interface to any sensor or actuator and Mist computing. RIIoT™ does not require any license or subscription fee. RIIoT™ is designed to interface directly to Cloud applications via JSON objects on a socket in the gateway. An example of how to connect to a Cloud application can be found here where Radiocrafts shows you how to connect RIIoT™ to Thingsboard, an open source Cloud platform. The RIIoT™ Net Controller, the Linux middleware that integrates in a Gateway and makes it easy to both manage the RF network and route data to user gateway applications or the Cloud. The controller provides a socket interface for user applications, making RIIoT™ compatible with any platform and user application written in any language. Data from RIIoT™ networks are forwarded to user applications as JSON objects that are easily parsed and forwarded to the Cloud. RIIoT™ RF is based on the IEEE802.15.4g/e standard which is a robust long-range network sufficient for most industrial applications. Radiocrafts has measured the range of RIIoT™, the details are available in our application note – AN027: RIIoT™ Range – Basics and Measurements Results. The range is summarized in the table below. RIIoT™ networks support a high node count per gateway driven by the short transmit pulse time and the Listen Before Talk (LBT) feature on MAC level. The risk of interference between simultaneously sending nodes is small with short Tx pulses. Listen before Talk (LBT) on Mac level makes RIIoT a “Polite Spectrum” device according to the European regulations. This increases the available on air time from 0.1% and 1%, to 2.8%, allowing for more air time than regular ISM band radios that transmits without any prior check if the band is free. Radiocrafts has done tests with RIIoT™ using 28 nodes sending data randomly every 4 seconds to one gateway. We achieved amazing results having 99.83% good packets received. To be fully compliant to the 2.8% rule, we need to reduce the update rate to sending every 5 seconds, that will also decrease the packet loss slightly. Frequent Readings/Updates are possible due to the short pulse length in IEEE802.15.4 e/g. This ensures that many messages can be sent during the space of an hour, without violating the maximum duty cycle requirements that are imposed by radio regulations. 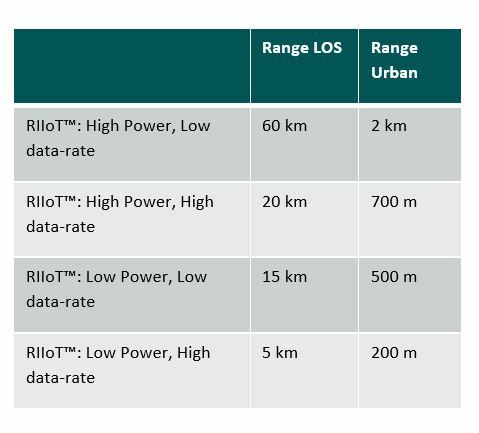 The RIIoT™ message length (45ms in long range mode) is less than 3% of a LoRaWAN long range message or a Sigfox message. Long pulse length is a major concern when frequent readings are required in a multi node network, as packet collisions will soon be a problem when the pulse length is long and the node count increases. RIIoT™ is an excellent network for near real time control applications. RIIoT™ is based on the IEEE 802.15.4 g/e which is a symmetrical wireless communication protocol. The RIIoT™ implementation as a star network means that the delays in the network are short, in the range of 10ms, and predictable. This is ideal for near real time control applications such as manufacturing, environmental control, asset tracking, alarm systems and many more. Your product will be future-proofed by RIIoT™’s over-the-air updates. OTA updates are possible because of RIIoT™’s two-way communication channel and the module’s internal flash memory. You can upgrade your RIIoT™ nodes in the field with new sensor/actuator interfaces, new mist computing algorithms, and updated security patches. You can also keep the underlying RF system firmware current using RIIoT™ Over-the-Air updates. A solution that supports long time intervals between updates and sleep, RIIoT™ has no mandatory background communication and includes transmit intervals that are very flexible to manage, see the ICI section for more details. RIIoT™ secures data in-flight using AES128-CCM, an encryption scheme that offers confidentiality, integrity, and authenticity assurances. AES128-CCM offers protection against eavesdropping, modification, replay, and impersonations. A unique AES key is established between each node and the coordinator using Elliptic Curve Diffie-Hellman (ECDH). So even if one node is compromised, data from the rest of the network is still secured. RIIoT™ users can also opt-in for end-to-end security to encrypt data all the way from the end node to the user cloud application. With end-to-end security, data is protected from eavesdropping or modification even in the gateway that is responsible for routing. RIIoT™ users can also use a “whitelist” so only approved nodes are accepted into the network. A whitelist requires a verification of the node’s security credentials prior to it joining the RIIoT™ network. The Intelligent C-programmable I/O (ICI) that is included in the SPR node, comes with APIs to read and write to the local interfaces, including UART, I2C, SPI, GPIO and ADC. The ICI is programmable in high level C. ICI allows the user to integrate to any sensor or actuator or any combination of sensors and actuators directly to the SPR node without any external MCU. The IEEE802.15.4.e/g supports symmetrical communication which means that messages can be sent at full speed both uplink and downlink. Good bi-directional communication is critical for any control application and also for making firmware Over the Air updates (OTA). The leaf nodes including the sensors and/or controllers are built using the SPR Module. The SPR module is a fully integrated module that only requires power and an antenna. The SPR module will interface directly to any sensor/controller and will easily build into a battery operated sensor box together with the sensor/controllers needed by the system’s designer. Click here for more details on the SPR module. The gateway is a linux based commercially off the shelf (COTS) gateway, where RIIoT™ is added using the GPR Module and the RIIoT™ Net Controller. The GPR module will accept RIIoT™ RF and transform this to serial data in the gateway or vice versa. This serial data will be accessed by the RIIoT™ Net Controller that will make the data available in JSON format inside the gateway, or JSON data coming in will be transformed to serial data for the GPR module. The GPR module can either be integrated in the gateway by the customer or, alternatively, the customer can use the RIIoT™ gateway dongle that includes a GPR module and can connect to a gateway via USB. Click here for more details on the GPR module and the RIIoT™ Gateway dongle. The user will program the SPR modules using the RIIoT™ SDK to create a flash image for download to the module. Click here for more details on the RIIoT SDK. The RIIoT SDK is available for download here. The package includes tools and firmware to set-up a RIIoT™ network through the GPR module.The package provides the ability for the user to set up key network parameters to optimize for a specific network’s requirement. Click here for more details on the RIIoT™ Gateway Software Package. The development kit includes all the hardware needed to start running a small RIIoT™ network from a PC. This allows the customer to test the network capabilities with minimum development resources needed. This is ideal for a first performance test in a customer environment. Click here for more details on the RIIoT™ Development kit. Application Notes to help you setup your RIIoT™ Network. Access the application notes here. For more details on the RIIoT™ Parts and Tools click here.